We are one of the leading Manufacturers, suppliers and exporters of a wide range of Printed Shopping Bags. Adorned with prints of the concerned brand with the help of flexographic or rotogravure printing methods, these trendy bags serves the need of shopping and elevates style quotient of our customers of all ages and preferences. 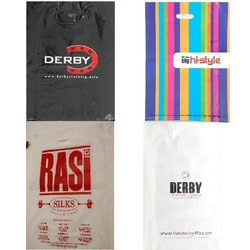 Moreover, these bags are durable and have high tearing strength owing to which our range of Printed Shopping Bags is high in demand amongst our clients. ALLWYN INDUSTRIES is an Plastic moulding article & bags-rolls manufacturing company servicing to the needs of various industries and market with its best quality. Allwyn Industries was established in the year 2000 with an focus to provide the various need for packaging , since then we grown up in strength and stature. We are one of the distinguished manufacture of premium quality. Our company puchase the entire volume of the raw material used in manufacturing from reliable source like Haldia petrochemicals ltd, Reliance industries, GAIL india , local re-processors and other importers. Allwyn industries is an sister concern of M/s.Gala plastics establish in 1982.Hence our company has an experince of serving the plastic industry more then 31years.